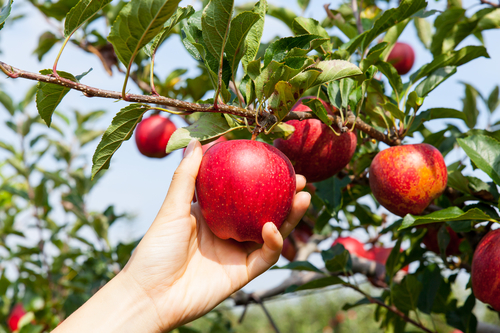 The fall may just be getting started, but apple picking season definitely doesn’t wait until the leaves start falling – actually, now is the best time to get started on your apple picking here in South Orange! If you want to hand-pick some apples that you can cook up (or just munch on!) in your Third and Valley kitchen, then visit these local apple orchards for a true taste of early fall. Make sure you stock up – you’ll have a hard time eating grocery store apples after trying these! Hawthorne Avenue Farm, located at 446 Hawthorne Ave, Newark which is about 15 minutes from your Third and Valley apartment, has an entire orchard of over 75 fruit trees, including apple, peach, pear, fig and cherry. Proudly named by the fourth graders at the Hawthorne Avenue Elementary School, the Hawthorne Hawks Healthy Harvest Farm is a 2.5 acre site that was formerly a vacant lot awaiting construction of a new school. Instead of sitting barren, this space has been producing local, pesticide free produce since 2012! Hillview Farms, located at 223 Meyersville Rd, Gillette which is about 25 minutes from your Third and Valley apartment, has been home to 53-acres of locally grown goodness for almost 150 years. Family-owned and operated, Hillview Farms grows farm fresh fruits and vegetables. Besides apple picking, make sure that you stop in to their general store and pickup today’s produce, fresh eggs and honey and feel good about the quality of your food.